1. Soak the cashews for 30 minutes. Discard soak water. Add cashews, coconut oil, and maple syrup to blender. 2. Process for about a minute. You should have a thick paste. If you need more liquid, add two teaspoons of water. In order to stand firm between the pineapple slices, the consistency should be a thick paste, not a liquid cream. 3. Assemble the stacks in metal rings or cups. Place one pineapple slice in the bottom of container. Spoon out 1/4 of the cashew nut paste and spread on top of the pineapple ring. Place a second pineapple ring on top. Add 1/4 more of the paste on top of the ring. Place 3rd pineapple ring on top and press down. Assemble 2nd stack in the same way. 4. Keep in the fridge until ready to serve. 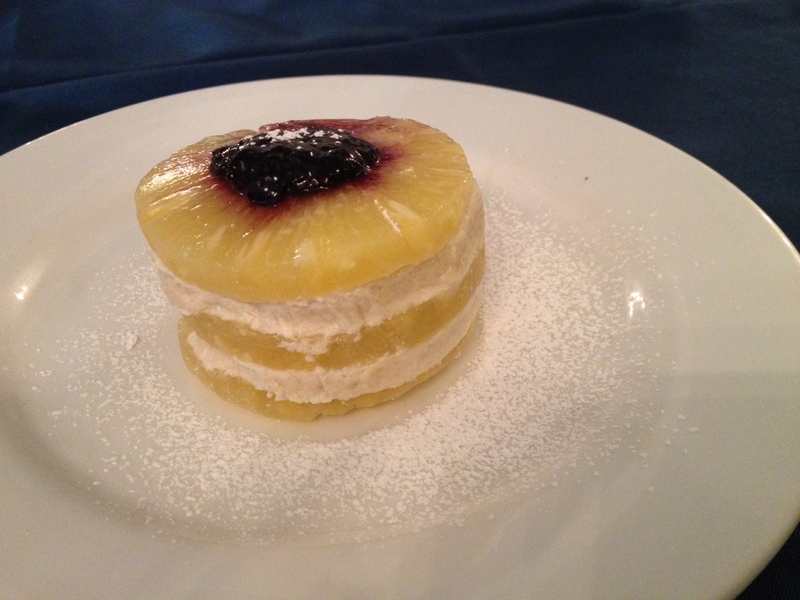 Flip container onto plate and garnish top of pineapple stack with blueberry jam. Let us know what you think of this easy vegan recipe: Stacked Pineapple with Cashew Nut Cream!